After yesterday’s 12-strikeout, no-walk complete game from R.A. Dickey, the league’s best knuckleballer moved into position with the MLB’s fourth-best xFIP, the MLB’s fourth-best ERA, and the 10th-best ERA-minus among historical knuckleballers. 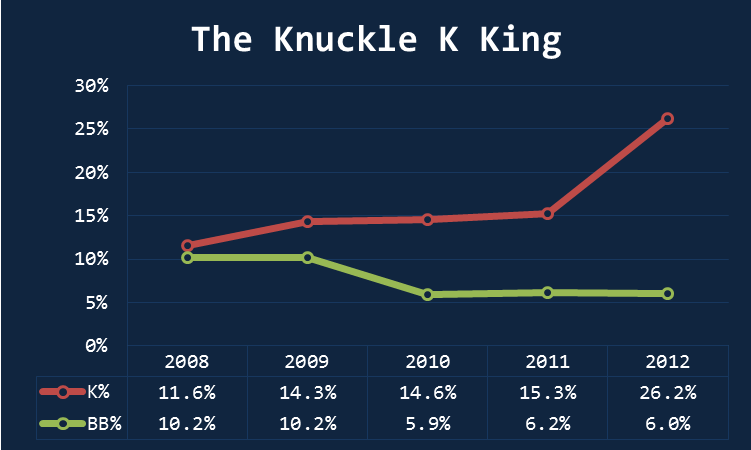 Advanced stats can sometimes fail us with knuckleballers because they produce especially weak contact. In his most recent start, Dickey got 10 ground outs, 1 weak single that may get ruled an error, and 1 infield fly ball. So naturally, FIP and xFIP under-appreciate Dickey to a certain extent, but does that mean he should be in consideration for a Cy Young award? Yes. Probably very much: Yes. Well first of all: Matt Cain’s perfect game last night certainly does not play in Dickey’s favor. Cain currently sports a better ERA and FIP than Dickey, plus he has one of the biggest badges a pitcher can earn in a single start, so if the San Francisco Giants pitcher can maintain his production and not totally Philip Humber before the end of the season, then he is probably the favorite. There is also Zack Greinke, pitching like Zach Greinke is wont to pitch (1.98 FIP, 2.34 xFIP — both best in the NL). And Cliff Lee (2.67 xFIP) and Stephen Strasburg (2.42 xFIP) have been sharp NL pitchers too. 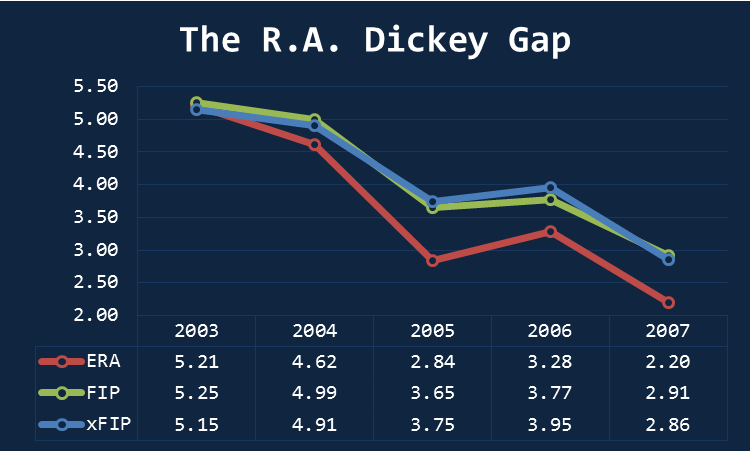 As Dickey has improved, his gap between defensive-independent numbers and his ERA has expanded. And it’s not like the Mets have had some line-drive-swallowing defense either. From 2009 through 2011, their pitching staff had a .296 BABIP — sixth worst in the NL. And so far in 2012, they have a .300 mark, good for 7th worst and near the middle of the NL. Dickey now has 10 consecutive starts without allowing more than 4 runs — with four zero-earned-run starts (all at or under 2.02 xFIP) coming most recently. He is, as the kids say, on a fire. Can Dickey keep up his career-best strikeout rate? I’m not sure. When the weather turns cold and dry, Dickey may lose his remarkable consistency. If that’s the case, kiss the Cy Young goodnight. On his career, Dickey’s worst numbers have come in July and Sept./Oct. Since becoming a knuckleballer, he has struggled almost exclusively in the season’s first and last months — the cold months. In 2012, he escaped Mar./Apr. with a 3.29 xFIP — the best opening month of his career. If he can repeat that success in the last month, then his numbers could be in a position for serious Cy Young consideration. And there is also the matter of his age. At nearly 38 years old, Dickey would not be the oldest pitcher to win a Cy Young award — that distinction belongs to the now-embattled Roger Clemens (42 years old in 2004). But he would certainly be the first knuckleballer to win the award and one of the oldest first-time winners. The merit of Story cannot be ignored when it comes to the voting for awards. And Dickey has quite the story. He was a failed pitcher who reinvented himself and is now — when most baseball players are putting out feelers for coaching careers — one of the best pitchers in the league. Plus he climbed Mount Kilimanjaro this past offseason and wrote an autobiography. He has a Disney-esque comeback story with a dynamic, adventuristic personality. Writers — i.e. voters — have a tough time resisting such things, so Dickey should have the peripheral peripherals, so to speak, necessary to allow him a Cy Young victory without the best numbers. So paint some extra nail polish on those precious fingernails, Dickey, because these final months can put you in the history books. We hoped you liked reading R.A. Dickey and Cy Young Hopes by Bradley Woodrum! The years in the first graph are wrong.